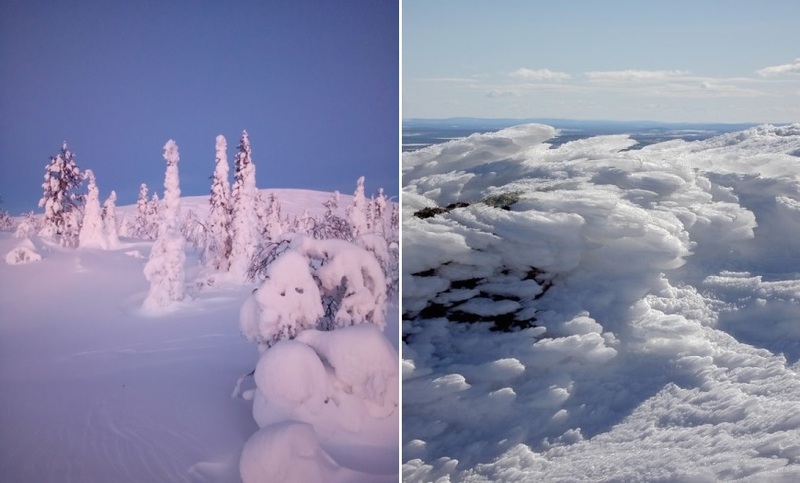 Destination of the Month: Pallas - Snowshoeing in the heart of Lapland! One of Finland’s absolute natural beauties is the highland of Pallas-Ounas-fells in the municipalities of Muonio and Enontekiö in northwestern Lapland. The area is also known as the Fell Lapland. In the area you can find one of Finland's most popular hiking and skiing trails in the fell area, Hetta-Pallas. It goes northward from Hetta, over the Ounas fells and further over (or by) the Pallas fells, up to Pallas Nature Center. Of course, if you wish, you can continue your journey from there to fell Olos or down to the center of Muonio! The route can be travelled in either direction. Next to the traditional Hotel Pallas there is one of the three Nature Centers in Pallas-Yllästunturi National Park. The other two are located in Hetta (Enontekiö), and Äkäslompolo (Kolari), on the slopes of fell Ylläs. There is a nice and easy parking lot at the Pallas Hotel and Nature Center, and it’s also a starting point of several hiking and skiing trails, which are of many different lenghts. There are also a couple of ski lifts to take the skier or boarder up to the snow on the slopes of the National Park. We interviewed Paula Pekonen, an experienced travel entrepreneur from Muonio, who told us about snowshoeing on the slopes of Pallas. The photos are Paula's magnificent, atmospheric pictures from her last year’s trip to the fells, including photos with her French client. According to Paula, January-February, partly during the polar night period (the sun doesnt't rise), is a wonderful time for snowshoeing, especially at Pallas. “January-February is the coldest time in Lapland. When Muonio shows a -30 degree frost, up on the fell Pallas there is about 10 degrees warmer." On very cold weather skiing might not be so nice because the skis won’t slide so well and the freezing air is difficult to breath. Quiet snowshoeing, on the other hand, keeps you warm and does not get you breathless. Nature is still sleeping in the winter, and it attracts with its calmness and with it’s pastel blue and grey colors. The Pallas hotel is still closed at the time, so there will be only few hikers then. That's part of the charm of the area, to hike in your own peace. "- But remember -!- It is important to have enough food and warm clothing with you, because you can't warm up indoors if you get cold", Paula reminds. However, there is no such a big risk of getting lost there, because the open fells are easy to navigate and the visibility even to the Hotel is good. If the wind blows too much, the hiker can take a route downward in the forests' shelter, where the wind does not bite that much. Accessibility is pretty good, because you can start snowshoeing right from the parking lot, just pick your direction! Very important thing to remember is, that the weather can change quickly and therefore its safest for beginner to snowshoe with a guide or a more experienced hiker, especially for longer trips. It is not worth to go on a strange terrain alone! Paula wants to remind us, that in the fell area of Lapland, there is the cleanest air in the world. Paula Pekonen is the entrepreneur of the Lomamajat Pekonen / Cabin and Apartment Accommodation at the Muonio Center in the center of Muonio. LIKE FINLAND STAR DESTINATIONS IN LAPLAND - THOSE WE HAVE SELF VISITED & TESTED AND CAN WARMLY RECOMMEND! Did you know this about Pallas? - The Pallas-Ounastunturi National Park was one of the first national parks in Finland in 1938. The park was enlarged and the name changed to Pallas-Yllästunturi National Park in 2005. - The Olympic fire of the only Olympic Games in Finland was lighted at the highest peak of fell Pallas in Taivaskero on 6.7.1952. From Pallas's slopes it was first run to Tornio, where it joined the Olympic fire from Greece, continuing its journey to Helsinki. - The area of Pallas and Jeris has been one of the most important training places of the Finnish skiing legend Juha Mieto. He calls the area his second home (Yle 2012).